A couple of weekends ago Robert and I planned a trip to the Merchants Market on the East Wall road. It’s a behemoth of an indoor market full of thrifty stalls of all shapes and sizes, overflowing with the weirdest and most wonderful of things. For example, I distinctly remember finding an industrial size tub of used Vaseline for sale during one particular outing. Unfortunately, once we arrived we were told the market was no longer. Giant, undiluted ugly crying face. All was not lost as we were diverted to a single stall remaining in the adjacent building, so we of course went in for a snoop. A few minutes in what did Robert spy? This Canadian post bag hanging from a curtain rod. I had to have it. Then I did that thing where I say to myself “hmm, maybe I’ll leave it and think about it“, but the thought of coming back and it being gone was too horrible a thought. I attempted some atrocious bargaining [I am painfully awkward at it, therefore rarely do it], but I managed to get 10 euro off. For me, that is a small and awkward victory. Some might say 25 euro for a post bag is a bit steep, but please keep in mind I was too floored by finding a bit of Canada in Dublin. When I got home I attempted to do a bit of research to see if it was a legit mail bag or not. 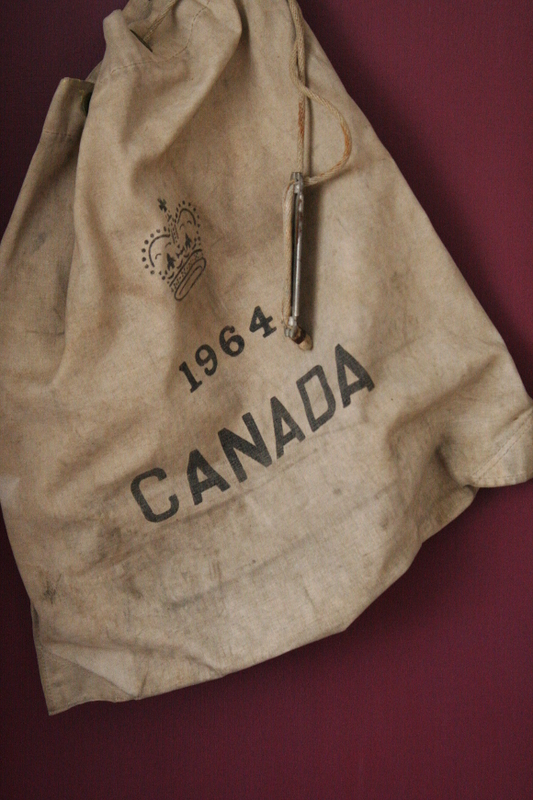 Unfortunately, not much showed up in regards to history behind this style, but I did find this same style 1964 Canada Post bag on Flickr [and also this picture of a similar bag in action]. So I’m claiming it’s legit, but from where in Canada, I don’t know. There are no other markings on it. FACT – anything placed on the floor will be owned by a cat within two minutes. 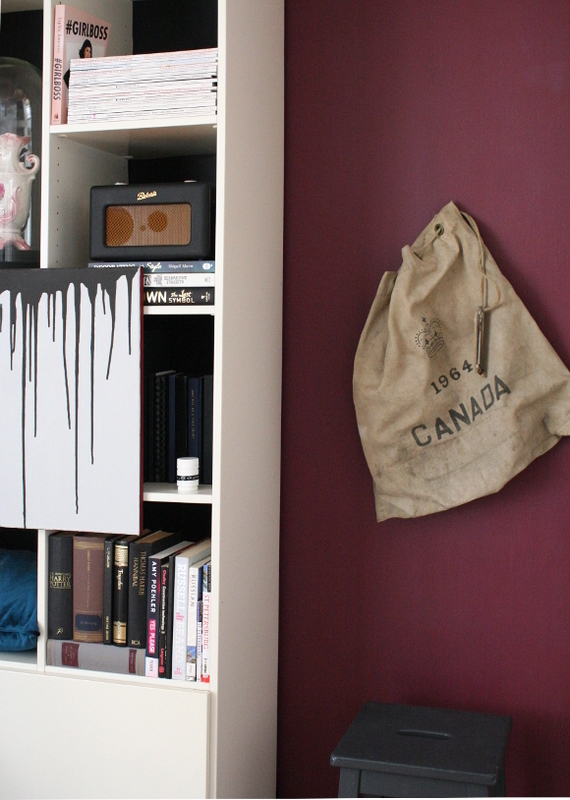 The old-school Canada mail bag I thrifted today at the Merchant’s Market (or what’s left of it), and I cannot wait to hang it up. Perhaps I can fill it with Irish Water bills? You can see mine and Emily‘s trip to Merchant’s Market 2 years ago here, back when my site was called ‘Hydrangea Girl’ and I had no fringe. YES!!! Thank you Leila! I thought as much. My worry was more so based on people coming over, seeing it and giving it stink-eye because it's in its original condition. I for one love it the way it is in all it's maily glory. Thank you! This looks more like a mail sack. They were used for transporting less important mail and therefore didn't require any locking mechanism on the bag. A bag like this would not have been used by a mail carrier for delivering the mail, but rather used to collect mail or transfer mail from location to location. You are some kind of fountain of knowledge. Seriously, thank you! Nerd away. I would have never known it was a mail sack vs. a mail bag. But now I know, and now I can actually tell people what it is, should they be as excited as us about a mail sack. And this is why I love thrifting with melting plastic. And this is why I'm furiously jealous that you two meet up and go thrifting together. FML. Agreed! Washing is for losers. Who even washes themselves anymore? Amateurs.